I love it - move it you kidding, gonna make it a sticky!!!! Did you see the cartoon I posted? I liked that one best. I glad you didn't mind them being posted there. 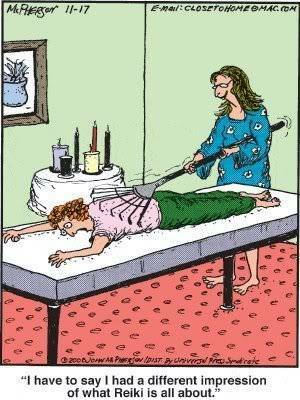 you mean this isn't Reiki? lol very funny! Nice to have a good laugh first thing in the morning! That is so funny Mia !! Thank you for sharing that !!! I love that one! Cracked me up! Where's the Animal Reiki one? I didn't see that one. Maybe it's still in the transporter beam.